It is commonly said that the United States is a Christian nation. This is usually said in the context of a discussion about issues pertaining to the separation of church and state. It is said mostly by Christians who wish to maintain this relationship between an old cultural institution and our culture. It is both true and false. There can be no doubt that our culture is certainly embalmed in Christian ideologies. From common phrases to ritualistic behaviors, our language and culture are steeped in Christian concepts that enriches our art, entertainment, and beliefs in many ways. In this sense, we are undoubtedly a nation that owes much of its identity to religion–specifically to Christianity in its many forms. But at the same time those men who gathered together in the beautiful city of Philadelphia in the latter parts of the 18th century had an idea. It was not an idea shared by all of them due to their many differences, but it was one that carried through in the final draft of the Constitution which is the legal basis for the United States. This idea was to create a state that would not be mired by religious differences. It was an attempt to make sure that the opinions of some men, or even the majority of them, could not create an official state position when it came to theology. Conscience. This was a key concept that underlay the discussion about what role religion would play in the states, as outlined in the Constitution. A man whose personal beliefs differed from that of another man, a town, or even the rest of the nation was still entitled to the same rights as anyone else. His conscience is not subject to legislation. A state that proclaims any theological belief will, inevitably, find conflict with the conscience of some citizens. The concept of separation of church and state was designed to not only protect atheists like myself (as well as Moslems, Hindus, etc) but also the many Christian sects that exist. If this is a Christian nation, which sect of Christian is it? This was precisely the concern that the Baptist church in Danbury had when Thomas Jefferson wrote them in 1802 (I write about this in more detail here). The separation was designed to prevent such absurdities from coming up in political conversations. Ask the next person who says that this is a Christian nation which denomination or sect it is. If they say that this is just a Christian nation, and not any particular sect, then ask them if the United States is works or faith based, Calvinsist or not, or if it might be unitarian (because they think they are Christians too) and watch them writhe out an answer. The separation of church and state can be viewed as a protection of the general public from these divisive and sectarian issues that will only seek to slow down political processes. Yes, this culture is predominantly Christian in many respects, but there is a difference between what we are culturally and what we are politically. And thank all goodness for that, because if we allowed our culture to dictate our politics in all manners, think of how aweful our politics would be. Oh, wait…I think I just had a epiphany; that’s why our political system is so screwed up! Hmm, that’s the first part of the first Amendment, from the Bill of Rights. So, if I have another god, say Allah, Vishnu, the Flying Spaghetti Monster, etc, then I am in violation of the first Commandment (and this a bad citizen of the Christian States of America) but am still protected by the first Amendment. And somehow this Christian nation overlooked this? This is a complex issue with many parts, and I don’t intend to deal with it exhaustively here. My intent is to look at Christianity’s status within our culture, and I admit that much of our culture is Christian. It is unfortunate that this is the case, because Christianity is a sickness that is not making us better, more moral, or making our nation stronger. In fact, it’s popularity with people should be compared with what else is popular. Much like the rest of our culture, the people in our nation are commonly held into habitual behaviors that are unhealthy for us. We eat fast food, watch bad entertainment, and we believe bad ideas. 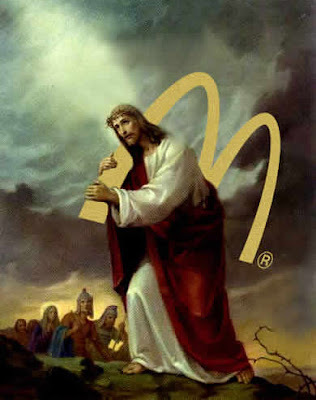 A Big Mac will cause you to have bad health, American Idol will limit your mind to a parochial worldview of beauty, music, and art, and Christianity will shield you from true profundity of thought about the world and limit us to iron-age beliefs that keep getting recycled with newer and newer hip words. This is not to say that anyone who ever eats at McDonald’s is necessarily unhealthy, someone who enjoys American Idol has no musical taste, or that all Christians are dullards, but that these types of things can only serve to diminish us. Sure, Big Macs taste great (it’s been so long since I’ve had one I’ll have to take others’ word for this), American Idol is entertaining and the people on it have talent, and Christianity has had some profound thinkers and has inspired beauty, but on a whole these things are more harmful to our culture than helpful. Just like unhealthy food is packed with fats, sugars, and other nutritionally deficient ingredients, the worldview that Christianity promotes is most often bad for us psychologically and intellectually. It asks us to “admit” that we are sinners, worthy of damnation. It asks us to submit to the will of God (Islam is equally guilty of this, as ‘Islam’ means submission). Christianity often asks us to submit our reason and rationality to faith; Martin Luther famously called reason a “whore ” and Augustine thought that understanding came after faith. That is, don’t think rationally unless you already accept the message of Christianity, then think within that belief. Theology is a tool by which we use our genius and creativity to make sense of what we emotionally, and not rationally, accept. We like to eat unhealthy food and don’t like to think of how bad it is for us. We like to believe in God and Jesus even though there is no reason to believe that either exists. We are eating and believing ourselves into corners out of which we do not easily escape. And so the genius of our American forefathers was that they understood that religion was divisive, and set up some protections from their sectarianism. They set up regulations to make sure that no particular belief can have legislative sway over others. And thank ‘god’ they did, because now we have a secular government that is set up to ensure that our fast food loving, American Idol loving, Christian nation does not destroy itself with it’s unhealthy habits. OK, so it doesn’t do that. In fact, all it really does it make sure that you cannot infuse your sectarian beliefs on the rest of us, and you are free to believe whatever silly things you want. Oh, and I have the freedom of speech that allows me to criticize your silly ideas. I’ll fight for a person’s right to speak so long as that person will, in return, fight to allow me to challenge their opinions and ridicule them as the content of their ideas merit. So how was I incorrect? I admit I’m no legal scholar, but if I’ve erred, please educate me. Have I stated untrue things? Have I forgotten the part of the Constitution that contradicts my view? What? Drive-by name calling is not really helpful.